There are loads of great products that I wanted to include but didn’t – the blog was becoming a little too long – I will do a follow up to this another time. Below are the links, details, and a recap, of the Clinique products mentioned in the video blog. Please leave me any comments of your best and worst products from the range. I love to hear other people’s preferences! Bottom Lash Mascara 2g £11.00 – Really expensive for the world’s smallest mascara brush. I’ve always felt confident with a normal mascara brush when doing my bottom lashes, and strangely felt less confident with this. 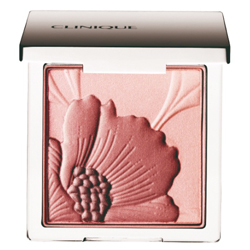 Fresh Bloom All Over Colour 9g £25.00 – Makes skin radiant, perfect over cheekbones and collarbone for highlighter, or as an all over powder that illuminates the skin. Subtle and pretty. A must have in my handbag. Long Last Glosswear SPF15 £14.50 – I have used Clinique’s Air Kiss shade of lipgloss for many years – a little picture of it is below as I didn’t have it with me t show on the video. It’s packaging has changed a few times, but it’s gorgeous colour has remained the same. Really enjoyed watching your video on the Clinique products. I suffer with dry skin and psorasis so don’t tend to try new products and stick to the ones I know. I use Dermalogica as my skin care routine. I used to love Clinque’s Dewy Smooth foundation as this was moisturising and provided good coverage which is what I rely on. They have stopped producing this and as an alertnative I was offered supermoisture make up but while this was moisturising it didn’t provide me with enough coverage for me to be comfortable with. I now use 2 foundations blended together – Bobbi Brown and Estee Lauder – the perfect foundation seems to be alluding me! I really like Clinique’s cream shaper eye liner in starry plum and suits blue eyes well and their cream eye shadow lasted well without creasing, I notice on their website they don’t do it anymore and they have a new product lid smoothie antioxidant 8 hour eye colour which I may well try. If you have any advice foundation wise that would be great! Well I am very impressed that you customise your foundations – I do the same! Nars have some gorgeous foundations – I like ‘sheer glow’, and Daniel Sandler’s Invisible Radiance is a new favourite of mine. I regularly use the Clarifying Lotion and Dramatically different lotion, and love them both. I combine them with other brands, like Biotherm, Dior and my lastest find, Mary Kay. Im loving your videos and your beauty blog. I was wondering with your experiences with various make up artists if you would consider doing a makeup tutorial for those of us that do not have access to amazing makeup artists 🙂 I would be interested in how they advise you to put on makeup! Hi Susie, I’m really enjoying your blog! I’m just wondering what are your thoughts on Clinque’s ‘dramatically different moisturizing lotion’? I’ve tried it and wasn’t particularly impressed, however I may just be expecting too much from the name? !